(by Andy Puzder, The Wall Street Journal: Mr. Puzder is the CEO of CKE Restaurants, which own Hardee’s and Carl’s Jr.) – The evidence continues to roll in: Broad increases in the minimum wage destroy jobs and hurt the working-class Americans that they are supposed to help. The latest evidence is an announcement that Wal-Mart, America’s largest employer, will close more than 150 U.S. stores, a move that will affect 10,000 employees. Fifteen years ago when our management team took over the financially distressed Hardee’s brand, we closed more than 400 underperforming restaurants. We made these decisions by asking this question: Given this store’s financial performance, will the company be more sound with it closed? Shutting down these unprofitable locations helped us nurse the company back to health—and create more permanent jobs. Similarly, “financial performance” was the first factor Wal-Mart noted in its closure announcement. Having to pay increased wages obviously diminishes a business’s financial performance. Wal-Mart voluntarily raised its base wage to $9 an hour last April, then announced in November that this resulted in a 10% reduction in earnings per share for the third quarter. This year Wal-Mart will raise its base wage to $10 an hour and is forecasting as much as a 12% decline in earnings per share. Councilman Noel Gallo, who supported efforts to submit the minimum-wage increase to voters, bemoaned the closure, saying that “losing a Wal-Mart is a blow to the city of Oakland” and adding that “what Oakland needs more of is jobs.” One way to snag those jobs would be to make Oakland more hospitable to businesses that create them. Lowering the minimum wage would be a good start. It’s harder to count the jobs that were never created in the first place because of the minimum wage. But here’s an anecdote: Wal-Mart also canceled plans to build two stores in Washington, D.C., where the minimum wage is $10.50 and rising to $11.50 in July. A November ballot initiative could bring it to $15. Councilman Jack Evans, who sits on the district government’s finance committee, reported, according to the Washington Post, that in closed-door meetings Wal-Mart “cited the District’s rising minimum wage”—as well as proposals to force employers to provide paid family leave and a minimum number of hours for hourly employees—as a reason to pull out. “They were saying, ‘How are we going to run the three stores we have, let alone build two more?’ ” Mr. Evans said. Mayor Muriel Bowser said she was “blood mad” about the store cancellations, but she shares the blame as a proponent of raising the minimum wage. Perhaps she understands this better than she lets on, as she has declined to endorse the proposed increase to $15. Jobs, salaries and benefits increase when businesses thrive. If you want to give working-class Americans a path to the middle class, adopt policies that free up the businesses who want to hire them. Otherwise, you’ve merely priced people out of a job. Mr. Puzder is the chief executive officer of CKE Restaurants. Published February 4, 2016 at The Wall Street Journal. Reprinted here Feb. 8, 2016 for educational purposes only. Visit the website at wsj .com. 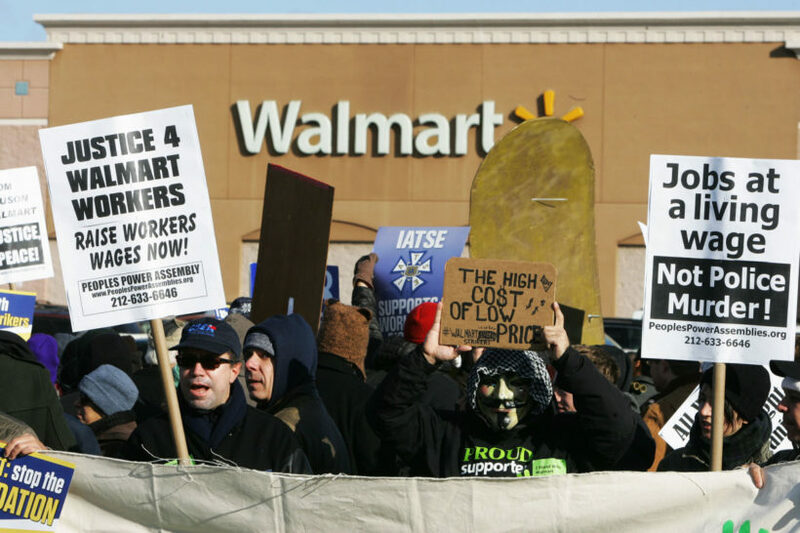 NOTE: In place of a news story, for today’s “Daily News Article” category we have posted a commentary as a follow-up to last Monday’s Daily News Article on Walmart’s store closings across the country. This commentary presents ideas that are not widely reported on but are important to consider. 1. Who is Andy Puzder? 2. What effect does Mr. Puzder say an increased minimum wage has on employees? 3. What did Walmart cite as the first factor it looked at when deciding which stores to close? 4. What is your reaction to each of the following assertions/explanations about increased minimum wage made by Mr. Puzder in this commentary? Councilman Jack Evans, who sits on the district government’s finance committee, reported, according to the Washington Post, that in closed-door meetings Wal-Mart “cited the District’s rising minimum wage”—as well as proposals to force employers to provide paid family leave and a minimum number of hours for hourly employees—as a reason to pull out. D.C. Mayor Muriel Bowser said she was “blood mad” about the store cancellations, but she shares the blame as one who supported raising the minimum wage. Perhaps she understands this better than she lets on, as she has declined to endorse the proposed increase to $15. In the face of increasing competition from online retailers such as Amazon, traditional stores like Wal-Mart are minimizing expenses to stay competitive. Substantial minimum-wage increases make the belt much tighter. But businesses that fail to adjust to a changing environment might cease to exist or shrink to mere shadows. This is a reality that progressive groups and legislators may choose to ignore, but businesses do so at their peril. Ask Borders bookstores or Blockbuster video. Ask a parent: Do you think this is a reasonable assertion? Explain your answer. a) Do you agree with Mr. Puzder? Explain your answer.